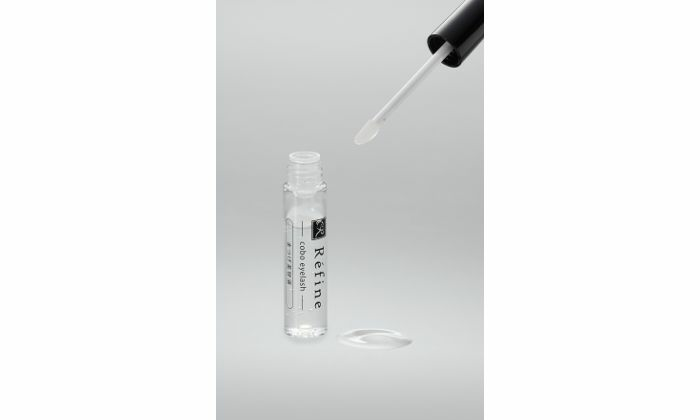 Utilizing our experience in the hair treatment field, our mixture of carefully selected ingredients helps to both simultaneously promote growth of and repair eyelashes. Naturally, our product is free of stimulants, meaning you can set your mind at ease when using our product. You can even use it over eyelash extensions, and even on your eyebrows. With eight ml, one bottle will last one to one and a half months, making it easy on your wallet, too. All you need to do is apply our formula to your eyelashes two times a day (in the morning and before bed). As the formula both repairs as well as promotes growth, you can use it not just on eyelashes but also directly on your skin for even better results. When the formula works quickly, you should start to see results within two to three weeks. Refine is a hair care brand that takes the concept of "Beauty that's easy on the body" as our core principle, and using our 30 years of experience researching the hair care field, we produce and sell products that anyone can set their mind at ease when using. We dedicate ourselves to being a company that can make women who want to stay beautiful 10 years down the line a reality.